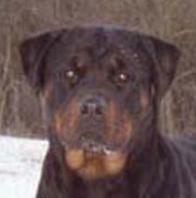 It is not unusual for Rottweiler ears to be held back or creased during their heavy teething stage (4-6 months). 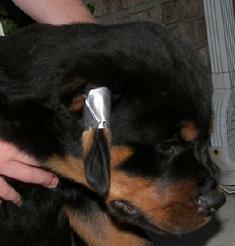 Sometimes we must intervene and tape their ears. 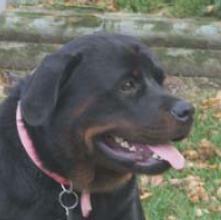 If not the ears may remain that way. 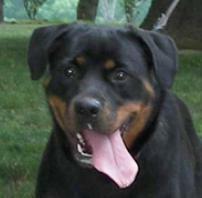 Incorrect carried ears can ruin the expression. Correctly carried should broaden the back skull and lay close to the head. 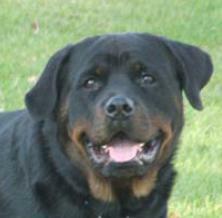 The ears should not be set too high or to low. What you will need: duct tape, scissors, cotton ball, alcohol and an extra pair of hands. You can tape one or both. 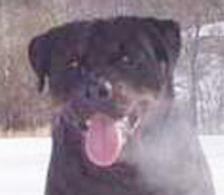 Wipe the inside flap of the Rottweiler puppies ears with the alcohol. Dry it. 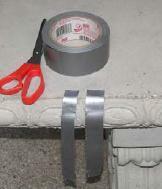 Split your duct tape in half long ways. Thank you Muck vom Blaurasen for being such a good sport! Leave the ears taped like this for 5 days. 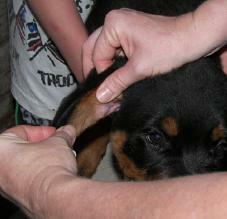 Then remove the tape for a day and see how the ears hang. It usually only takes one taping. This method is on 5 days off 1 day. Do not leave the tape on for long periods of time. 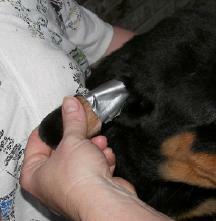 We have taped several puppies ears over the years like this and it works much better than the old method of using moles skin, a quarter and taping under the chin (which usually causes ear infections). 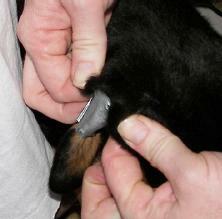 This method can be used on youth and adult dogs but it is not as successful.